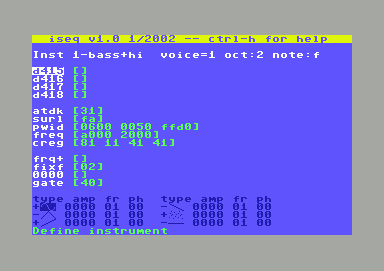 Iseq is, of course, a C64 music composition program, written totally from scratch (i.e. it isn't just a Tunesmith update). It has a lot of features but is fairly easy to use, with online documentation (as well as text stuff below). Feedback would be most welcome! 6/29/02 Added Commando remix, ransid, and a little defense of iseq :) 5/31/02 Page officialy goes online! ISEQ1.D64.gz A .d64 of the binaries. iseq.tutorial Tutorial on getting started. commandcov.tune A cover of the Rob Hubbard classic. commandcov.sid sidplay version, kindly provided by Mark Seelye. commando.notes Some notes on the above cover. examples.tune Some example instruments (note: some adapted from instruments written by daBlondie in Tunesmith, lo these years ago -- just want to give credit :). The source is pretty big, so it might take a while to get up here. But if you email me I'd be happy to send it to you (does anyone even look at this stuff?!?). 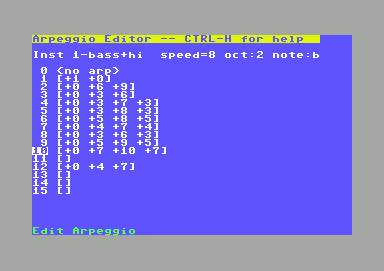 The main editor. Iseq allows multiple tunes, among other things. Online help is available for all screens. 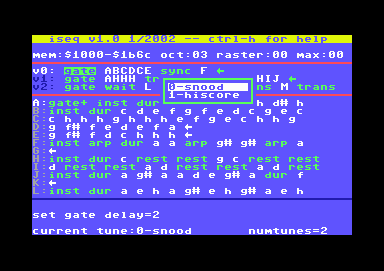 The instrument editor. 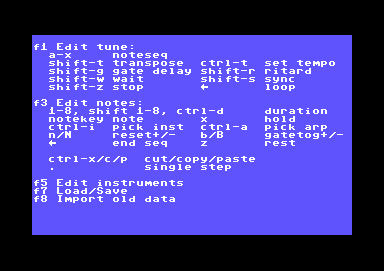 Instruments consist of sequence values or modulation schemes, and are compiled into the player. Arpeggios can be of any speed or length, with both positive and negative values, etc.